Christmas is getting closer and closer! Can you belive I still have not finished my Christmas cards yet? Looks like I have a mandatory stamping day ahead of me today so I can get them mailed out tomorrow. Today I have the card I made for my girls in the In Color Club. November was our last month of In Color club until the new round starts in June with the 2013-2015 In Colors. 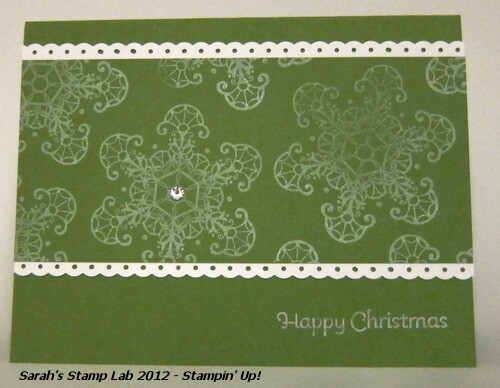 If you would like to be a part of my In Color Club go to my Stampin' Up! store page and click on Request my Newsletter. You will then get all of my announcements including upcoming classes, open houses, clubs and product shares! Can you guess what the In Color Color of the Month was for this round??? Lots and lots of Gumball Green. I think this is the best Christmas green I have seen in a while! This is so pretty! Love that green color. Thanks! This is one of the new In Colors from SU called Gumball Green. It's currently my favorite green to use!